Is there anyway to copy/paste (desktop's) clipboard content to EditView on Android Emulator? With v25.3.x of the Android Emulator & x86 Google API Emulator system images API Level 19 (Android 4.4 - Kitkat) and higher, you can simply copy and paste from your desktop with your mouse or keyboard. Note that an alternative method for including spaces in the text is to substitute %s for each space character. (5554 is the default port. The title bar of the emulator shows the port that is being used, so you can see if it's different). This works really well for links as the message is automatically converted into a hyperlink which you can click without having to copy / paste it into the browser. Once the emulator receives the message you can copy it and paste it wherever you like. Not sure if that's useful, but, if you need a long URL from desktop browser to be opened in mobile browser, you can send SMS with that URL and open directly from message app. Just copy from wherever, click and hold on the emulator phone's edit text where you want the text to go (kind of like you would press and hold to paste on an actual phone), the PASTE option will appear, then PASTE. 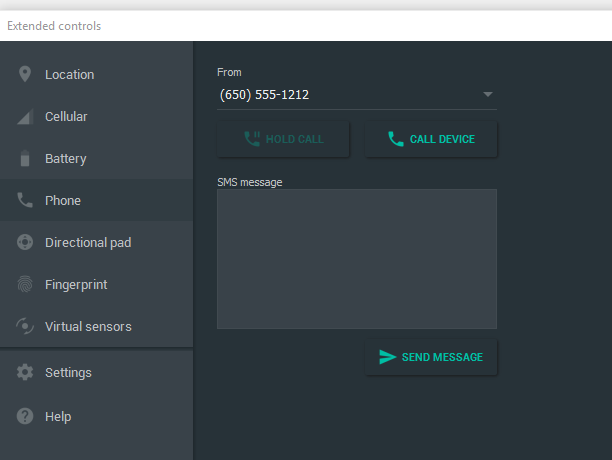 maybe a little bit tricky, but you could send an sms to the emulator by using the emulator control. then you do not have to retype all the text if it is longer and can copy-paste it in the emulator. adb shell input text "'$(xclip -selection c -o)'"
Have you looked at C2DM? chrome2phone and fox2phone can send links and clipboard text and automatically copy it on the phone. Also, try using the adb shell. There's a service command (/system/bin/service) which can use services (service call clipboard ...). The transaction codes are 1, 2, and 3, for getClipboardText, setClipboardText, and hasClipboardText respectively. alias ap="pbpaste | xargs adb shell input text"
Then when you open a new terminal window, typing "ap" will paste whatever is on your clipboard into the emulator's actively selected text field. You can do this without workarounds too. Just click and hold for a bit in the input field till the paste notification appears and then click on paste. That's it! Using Visual Studio Emulator, Here's my method. Use the Additional Tools (small >> icon) for the emulator and go to the SD Card tab. Select a folder on your computer to sync with the virtual SD card. Pull from SD card, which will create a folder structure on the selected folder. 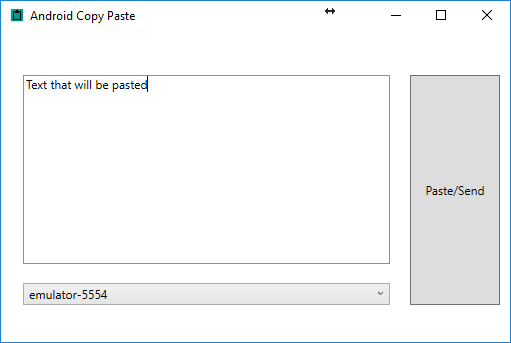 Create a text file containing your text on you computer in the download directory of the virtual sd card directory you created before. Whenever I need to send text to the clip board. Edit the text file created above. Go to Additional Tools (small >> icon) and chose Push To SD Card. Once set up it pretty easy to repeat. The same method would be applicable to other emulators by you may need to use a different method to push your text file to emulator. wrote it in a couple hours to work around this problem. I am now back on 100% linux, so feel free to join it as a contributor or maintainer! Write command: adb devices (it will list the device currently connected) Select Textbox where you want to write text. Write command: adb shell input text "Yourtext" (make sure only one device is connected to run this command) Done! I came here looking for a solution to the same problem, and ended up writing an Android application to solve this problem. You can download it at http://www.box.net/shared/6203bn441bfltkimajmk. Just give a URL via Preferences menu to point to a place where you can change the Web response easily. The first line of the Web response will be copied to your emulator's clipboard for you. More details can be found at http://agilesc.barryku.com/?p=255. userinput="$(sed 's/ /%s/g' <<< $1)"
'Your text to emulator input' will be input on the emulator text field. Kudos to Eliot for his substitution string for sed. Not the answer you're looking for? Browse other questions tagged android copy-paste or ask your own question. How can I copy/pate multibyte characters on Android Emulator? Paste text on Android using ADB?